So, Ajumma means "married woman" or mrs. or ma'am, basically. So, any married woman is an ajumma. However, there is also this Ajumma stereotype joked about by younger Koreans, and especially by young foreigners in Korea (who picked up on the joke and love it). 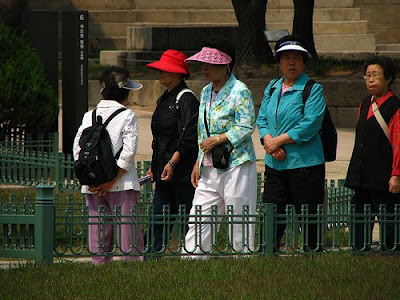 The ajumma stereotype is a mid aged woman, probably with a short perm, likely wearing some sort of floral shirt and a type of visor. These visors are popular in Korea mostly with ajummas. Actually, they're pretty much popular ONLY with ajummas. The Ajumma Visor if you will. The stereotype goes beyond the physical however, the Ajumma is also a commanding personality. She gives her husband a strict allowance and is a terror on the subway, pushing or shoving people from behind to get to her destination. At a crowded restaurant the one night, as we were waiting for a table, a youngish woman behind us in line went over to a table they were clearing to try and take it. "Ajumma in the making," my fiancee remarked. Finally, the hiking ajumma. She's sporting the same visor, but has a athletic jacket, backpack, and hiking stick. She will also own you on the mountain. I read a joke somewhere about the depressing realization foreigners teaching in Korea face about their own physical shape when they are consistently overtaken on the slopes by ajummas. The blog Stuff Korean Moms Like, while I believe focuses on the stereotypical Korean mom living in North America, can pretty much double as a blog about Ajummas. Posted by Andrew at 1:14 a.m.